Size : 35-7/8" x 20-15/16"
Elkay CTXF134179R Crosstown Stainless Steel Single Bowl Farmhouse Sink - No Apron, 33-7/8" x 17" x 9"
Elkay CTXF134179RC Crosstown Stainless Steel Single Bowl Farmhouse Sink Kit - No Apron, 33-7/8" x 17" x 9"
One of the main advantages in installing farmhouse kitchen sinks is that the front can better withstand the test of time than that small sliver of counter space you see with other types of sink installations (undermount, drop-in, etc.). For obvious reasons, they are commonly referred to as apron front sinks. Farmhouse kitchen sinks have an exposed front that drops down to the cabinet below. It sits flush with countertop edges and takes up some of the cabinet or counter area. With a farmhouse sink in your kitchen, it would be easier to do your kitchen tasks as it is installed farther forward, situating closer to the work area that you won't have to lean forward that much and strain when washing dishes. One thing to consider is the size of your sink and installation space. 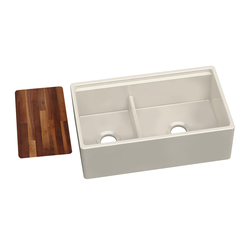 You need to have enough space below the kitchen sink for your new farmhouse sink. Not just larger and deeper, farmhouse sinks are wider. With their weight, size, and exposed front, these farmhouse sinks need a special base or custom cabinet to accommodate it and, since water may drip on the cabinet which might cause damage to it. Regarding functionality, there is no better sink than an apron-front design. They bring an artistic, vintage look to your kitchen decor. With its lip design, water, or suds won't puddle on the cabinet countertop (but will just drip over it and fall to the ground). They can be more expensive, depending on the material. 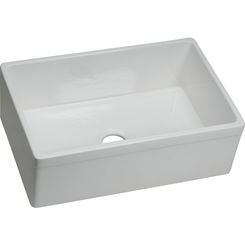 Typically, farmhouse sinks are heavy and are a little more difficult to install. Known to have wider bases and deeper bowls, farmhouse sinks can easily accommodate larger pots and pans and minimize splashing, but it may also be uncomfortable for taller users, young children, and anyone who is seated to reach the bottom of the sink. There is no gap between the countertop and the sink which makes the front so easy to clean. With the different material options, get to know the characteristics of each to find the right fit. 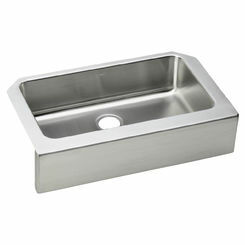 Stainless Steel - is the most used material for kitchen sinks and known for its durability. 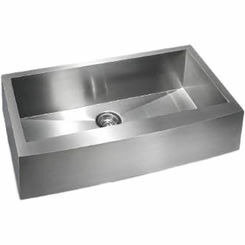 Stainless steel sinks are resistant to damages caused by hot or cold objects and impacts. Copper - is durable enough to withstand rust or tarnish. 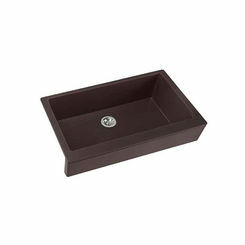 Copper sink material is also known for its anti-microbial properties and requires little maintenance. 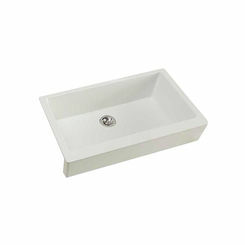 Fireclay - made of clay, fireclay sinks are known for its resistance to scratches, chips, and almost anything. 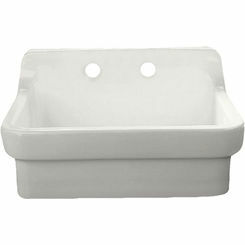 With an easy-to-wipe glossy surface, fireclay sinks are easy to maintain that you won't have to spend much time in cleaning the sink. Quartz - has a non-porous surface which makes it easy to clean and resistant to heat of up to 535 degrees F. It can also endure harsh cleaning materials and liquids. You have lots of choices of colors such as stainless steel, brushed satin, white, Lustertone, copper, chestnut, biscuit, and more! With all of the options, you can choose a color that will look beautiful for years to come. 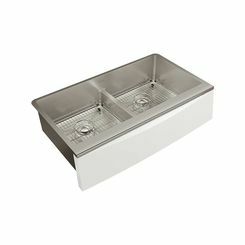 Farmhouse sinks go well with different kitchen decors. You have three options for placement: positive reveal, neutral reveal, and negative reveal. If you want to show most of the flat top edge, then you can choose the positive reveal. 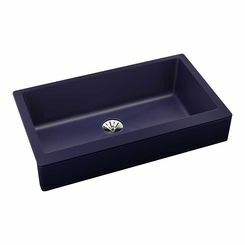 But if you want the whole top edge of the sink to be covered by the countertop, then the negative reveal is an excellent choice. 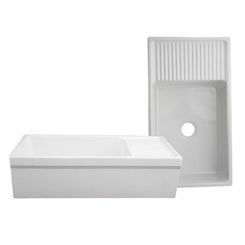 You can also opt for the neutral reveal in which the inside of the sink will be sitting evenly with the vertical edge of the counter. Supported only by the base cabinet, you can measure the real height of the apron-front sink, then, transfer that measurement to the interior cabinet sides. After, mark a level line from back to front. Add and install supports. You can attach them by applying a construction adhesive and driving the square-drive deck screws through the cabinet sides into each support. Measure the sink front's height and mark the base cabinet front cutout. 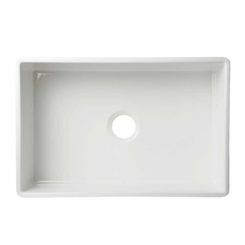 But before that, you can add 1/8 inch to that dimension so the sink can rest just above the cut edge without its support. Cut the cabinet front using a jigsaw. You may need to replace doors with smaller ones or remove them depending on the size of your base cabinet. Test-fit the opening of the sink. The side supports must be able to carry the full weight of the sink. The sink should be level from front to back and side to side, and if not, you can adjust it by adding tapered wood shims. Install the sink. Fill in the gaps below the sink front, and between the sink and countertop (with the use of silicone caulk). You may also want to check out this apron-front sink installation video from Kohler. Have you wondered how it is called a farmhouse sink? In the late 1600s, people did not have running water or water was not that easy to access in the household through pipes, so sinks with deep basins like these were used to help conserve and store water for the home. The farmhouse sink was made to hold all of the water. Here at PlumbersStock, we offer a great selection of farmhouse kitchen sinks at a favorable price. If you need a little help in selecting the right sink for your kitchen, we are here to assist you today. 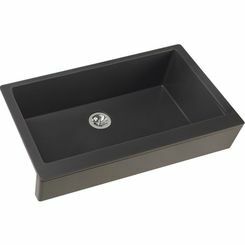 You can't go wrong if you choose to outfit your home with a farmhouse sink from these different best brands. If you decide that a farmhouse sink is a right style for you, get your sink now and improve your kitchen experience.  Keep in mind that we also carry plumbing parts and kitchen accessories for any decor. 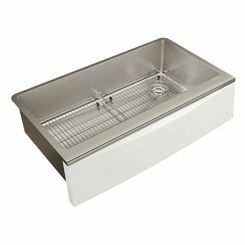 No matter what kind of kitchen sink you need, we have it.